A “Rare Gem”. 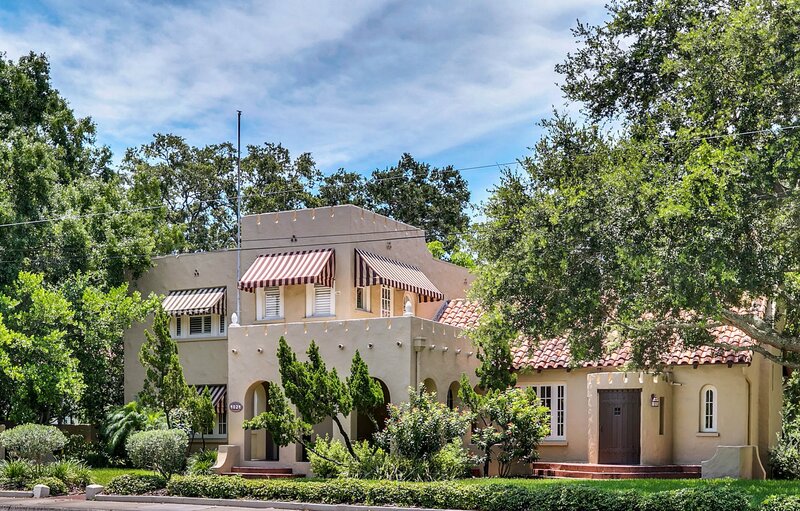 Own a unique piece of history like no other, in the heart of prestigious Virginia Park in South Tampa. ************************************************************************************************************************************************************************************************************************************************************************************************************************************************ This one of a kind masterpiece was built by Val Maestro Antuono, the largest cigar manufacturer of his time. This stunning 6 bedroom, 6,000+ sq.ft. Florida luxury estate home sits on over 3/4 of an acre, encompassing nearly an entire city block. This home's 1920's authentic architctural artistry and design surround you, standing the test of time for over 90 years and has been lovingly maintained. You will be captivated when you enter the double carriage doors and are transported into another time in the custom nearly 2,000 sq. ft. loggia, designed for true indoor/outdoor entertaining and adorned with original Spanish tile. Here you can gaze out to the pool or gardeside, or easily access the home's generous 4 car garage and detached 650 sq.ft. pool home / mother-in-law suite. Even more opulent is the 5,310 sq.ft. main house, with a stately 35 x 20 wood beamed ceiling living room, oversized magnificent foyer with sweeping staircase and an impressive 20 x 18 dining room. The beautifully appointed finishes and majestic architecture make it truly a South Tampa Luxury Home. This expansive home offers both formal and casual living spaces and boasts inspiring amenities throughout. The kitchen is bright and updated with stone countertops. Off the kitchen there is a wine cellar / butler pantry, a second casual dining area, and a comfy family room. Imagine all of the entertainment possibilities in ths masterfully designed home ! The unique character and charm continues upstairs where you will find 5 bedrooms ( including dual master suites ) and 3 full bathrooms. There is also a spacious office and a seperate library. Additionally there is a 2nd floor kitchen, dedicated dining area, and a large sitting room / family room that is adorned with an original tiled fireplace and a balcony overlooking the grounds and pool. The endless possibilities with all of this space are sure not to disappoint. Outside this exquisite home, the walled-in backyard consists of a beautiful mature garden with built in seating and an oversized spanish tiled pool structure ready for a fountain. As an additional bonus, there is a 620 sq. ft. 1 Bedroom / 1 Bath Pool House or Mother-In-Law Suite, overlooking the pool and picturesque shaded oaks and lush tropical landscaping. The location is unbeatable in the prestigious zip code of 33629 and in the top rated Plant High School District. It is only minutes to the Palm Ceia Golf and Country Club, Tampa International Airport, preforming arts venues, museums, professional sports, fine dining and the abundant conveniences Tampa offers as one of the fastest growing cities in America. Extravagant entertaining, luxurious living and the prestige of owning a significant historic SOUTH Tampa Mansion await you.